Editor’s note: Bella Supiana is working with JJ Kavanagh & Sons on a new series called ‘Tastes of Ireland’. She’ll be travelling to our destinations around Ireland and scouting out the best places to eat for hungry travellers. In this post she gives us her pretty scrumptious 2017 bucket list, in no particular order, for you to tackle throughout this splendid new year! Throughout 2016, I had the pleasure of traveling around Ireland with the wonderful JJ Kavanaghs in search of the most delicious food for their hungry passengers. I ate until I almost popped, tried some savage food and drink, met superb restaurateurs and cafe owners along with the chefs making it all happen in the kitchens, all while snapping lots of pictures and scribbling down loads of notes so I could blog about it here on #tastesofireland. This blog is for you guys, a foodie guide for wherever you are headed next with JJ Kavanaghs! I hope that we have fed you with a plate full of deliciousness and helped find you some cracking deals for when your tummy groans, either before or after embarking on a trip. Today, I reminisce on those memories in all their yumminess. I visited so many excellent places but I wanted to narrow it down to my top ten. Believe me, this was no easy task and I can already hear my belly grumble… So here is a pretty scrumptious 2017 bucket list, in no particular order, for you to tackle throughout this splendid new year. I particularly adored their mini sausage rolls and their exotic pineapple chutney atop Limerick ham on a homemade yeasted bread was a delightful surprise. The scones were melt in your mouth and if the entire gluten free dark chocolate cake was set in front of me I’d have eaten the lot! Choose a Sparkling Afternoon Tea with a Glass of La Riva Dei Fratti DOCG Prosecco for a boozy afternoon. I know this place is going to woah you, it’s such a treat! I adore this market, I actually think it’s one of the best food markets we have in Ireland. Filled to the brim with excellent produce from veggies to jams or artisan breads, you can also pick up some delicious street food while walking around. 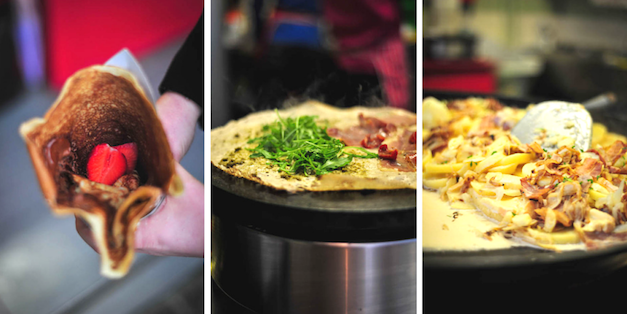 My top suggestion would have to be Bon Appetite, where you can grab ‘real deal’ French crepes from the lovely French couple who have been there for about ten years and are famed for their delicious nutella crepes! 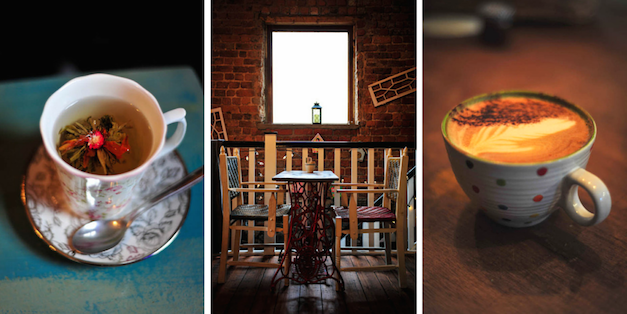 This little gem of a place, owned by the friendly Adam is the spot to chill out in Limerick. They serve up superb tea and coffee and scrumptious little naughty treats – think chocolaty brownies and the likes! Pace your time here, it’s a place to sit back and even play a board game if you are feeling it. I’d definitely suggest spending a couple of hours here after strolling around The Milk Market which draws hoards of people (you’ll see why!) so at times it can be a tad overwhelming… You’ll be ready to kick back and The Stormy Teacup definitely has your back! Simply one of the tastiest places to get a seafood dish along with experiencing a traditional Irish pub! Hidden down Clancy’s Strand with views of King John’s Castle and the river Shannon, it is one of my favourite pubs in Ireland. They have brilliant booze, I hear their pints are legendary… But I always stick to my G&T – a fresh Hendricks Gin and Tonic always hits the spot. Their chowder is velvet creaminess with hearty chunks of potato and veggies but don’t worry they don’t skimp on the fish here, expect it to be jam packed with salmon, whiting, mussels and prawns! And if fish just isn’t your thing, fear not as they rustle up epic toasties, chicken wings, mega burgers and even delicious vegetarian gratins or spiced kidney bean chickpea patties. Something for everyone, you’re going to love it! Tapas has taken Ireland by storm with local produce and innovation being at the heart of it all. Irish chefs have definitely put their stamp on it. Dylan Mcgrath’s Fade St Social up in the heart of Dublin is one of the best tapas we can experience on our little island. Spanish tradition comes through with a twist of Irish-ness which I adore! They serve a bacon and cabbage burger… Sandwiched between a fluffy milk bun is fried pork belly, smoked pudding, crispy cabbage and peppered bacon. How delicious does that sound? I particularly loved their crispy salt cod brandade and squid with pickled red peppers, chickpeas and chorizo. It’s sauce, rich and full of flavour. Definitely one for a cold day, I can feel it warming you up right now! One of my all time favourite places to eat in Dublin city… A superb mixture of Asian classics like kimchi on crispy fries, deep fried chicken in fluffy bao buns with gorgeous katsu curry sauce or a wicked chili beef soup. They also knock up some deadly burgers – for the veggies expect to find a sweet potato and tofu patty with grilled big succulent portobello mushrooms and for the meat heads you have your classic cheese and bacon, kimchi or big pig burger to choose from. Found in the heart of Temple Bar is Boxty House, owned by Irish food legend Padraic Og Gallagher. This place is a must try for both tourists and local Irish alike. It has such a beautiful traditional Irish pub feel but they serve up rocking classics with some tasty twists! They are known for their Boxty, an Irish potato pancake that is both fluffy and full of sustenance. Padraic’s recipe is a lot thinner than the traditional one and I absolutely adore it. Growing up it was his favorite thing to eat and years later it gave him a tasty idea to open up a restaurant dedicated to all those wonderful memories he experienced as youngster! The roast cauliflower and black kale boxty dumplings is a whopper of a veggie dish but if you’re feeling something warming wrap your hands around one of their stews and if you’re new to Ireland go all out and share the stew platter with your mates. You’ll get three stews to taste from – Irish lamb stew, Guinness beef stew and Dublin coddle which I can guarantee your belly is in for a warming hug! The ‘famous Gaelic boxty’ is famous for one reason only – it’s out of this world, utterly delicious! Think tender Irish beef fillet wrapped in their thin boxty pancake and smothered in rich creamy Whiskey and mushroom sauce. A total must try! Pichet is one of the coolest places to dine out in Dublin. Very stylish and chic, it’s a fantastic place to get great food along with outstanding cocktails. They are serving up fine food, offering both fresh and rich tastes for every palate. Their menus seem to change regularly but when I ate there, I was wowed by their fresh citrus cured salmon with avocado mousse, soy mirin dressing, cucumber, wasabi and radish. It was deliciously refreshing and something I hadn’t eaten before. I also devoured their juicy chicken breast and buttermilk wing which was served with a crisp succulent fondant potato, spinach and a tarragon veloute sauce. Refined and hearty at the same time. Definitely worth seeking out if you are feeling an intimate dinner. If I’m totally honest, Cafe Sol has been one of my favourite places to eat while on my #tastesofireland journey with JJ Kavanagh’s. The food is truly outstanding and the staff are wonderful. It’s also beautifully lit up with it’s yellow sunshine like painted exterior which put a huge smile on my face. The food is mind blowing. I loved their ham hock terrine, it was literally the best I have ever tried, very compact but still so succulent and flavoursome at the same time. It was paired with a wonderfully crunchy tart cauliflower and carrot piccalilli along with a crisp thin slice of sourdough – yum! Their eighteen hour slow cooked maple glazed pork belly served with a bacon and cabbage croquette, black pudding cigar, luscious pomme puree and an apple and cider compote is out of this world. The combination of everything on the plate is nothing but dreamy – creamy, hearty and well balanced with the slight tartness of the apple compote. I couldn’t recommend here more, it’s worth traveling all the way to Kilkenny and I know I’d drive there right now if I wasn’t busy! For some of the tastiest fresh expressions of Asia, Aroi is the place to hit up! They offer some of the best noodles, soups, curries and rice dishes. I always feel like I’m in south east Asia when I eat there, how cool! Aroi is in both Kilkenny and Limerick so you are sorted for fast high quality food in a jiffy. They are both quite near JJ Kavanaghs bus stops so there’s really no excuse for giving these guys a go! I’d definitely give their Thai calamari with crushed black peppercorn and chili a go. Very fragrant with a lovely kick. Their pad Thai is a classic which is very similar to the noodles you’d find bang in the heart of Bangkok – yep, that good! For rice lovers try the fluffy brown rice with chicken and cashew nuts stir fried with wild and water chestnut mushrooms, baby corn, dried chilis and scallions. It’s rich in flavour but still quite fresh. Book a trip to Kilkenny, Dublin or Limerick with JJ Kavanagh & Sons and experience our top 10 places to EAT in 2017!